The new Microfleece™ range brings our latest materials and technologies to achieve the ultimate in comfort and flexibility for all weather versatility. 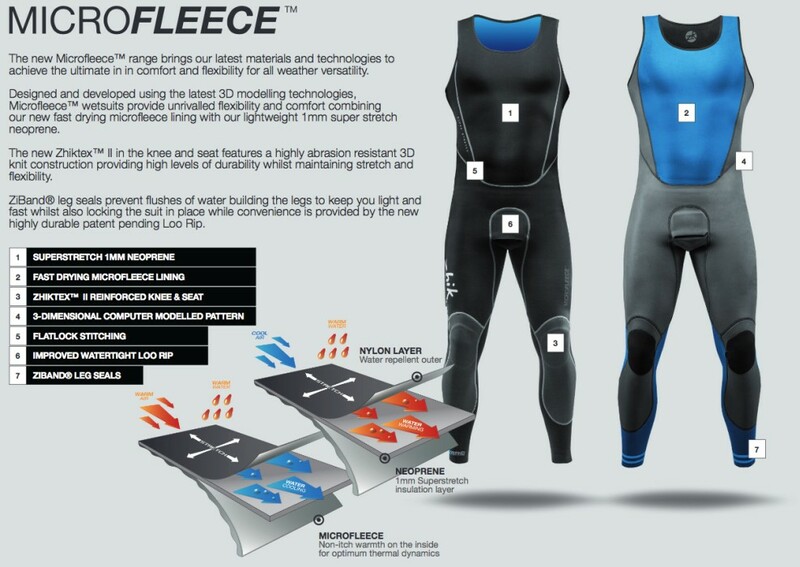 Designed and developed using the latest 3D modelling technologies, Microfleece wetsuits provide unrivalled flexibility and comfort combining our new fast drying microfleece lining with our lightweight 1mm super stretch neoprene. The new Zhiktex™ II in the knee and seat features a highly abrasion resistant 3D knit construction providing high levels of durability whilst maintaining stretch and flexibility. ZiBand™ leg seals prevent flushes of water building the legs to keep you light and fast whilst also locking the suit in place while convenience for men is provided by the new highly durable patent pending Loo Rip.